So you want to buff your beautiful pickup but you’re scared of burning the paint? No problem! Just follow these right step-by-step instructions to buff your pickup without burning the paint and you’re ride will be glowing in no time. Thoroughly wash your car, preferably by hand. Make sure you do the work yourself to guarantee a quality job. When you finish washing your pickup stop; do not dry it. A high speed buffer is recommended, but be careful. High speed buffers have the potential to damage the finish if used improperly. Have a knowledgeable friend teach you how to use one properly. Put a damp pad on your buffer’s polishing wheel and apply a decent amount of compound to the first body panel. Use the wheel to spread the polish, maintaining a medium speed. With a constant amount of pressure move all over the panel, keeping the polishing pad parallel to the car’s surface. Failing to stay parallel risks unsightly swirl marks. Once both the compound and water have been absorbed by the polishing pad an attractive new finish should emerge. Good job! Now continue to the next panel and repeat the process exactly. Don’t forget to take a break and rinse your foam pad with the water hose. Neglecting to clean your pad will lead to an over saturated pad and an uneven finish. Now that your pickup is gleaming, you’ll want to wash it again to remove any foam, excess wax, or water spots that might have been left over from the buff. This time you can dry it. After your pickup has dried check over it for any swirl marks. If the buff didn’t get rid of them your last option is to apply a coat of wax to downplay their prominence. Use an orbital sander with a foam pad to apply a mixture of paste wax and finishing polish. The mixture should be about 60:40 paste to polish, directly applied to the pad. 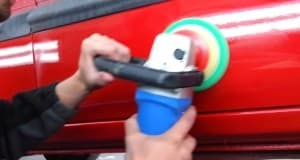 Just like the buff, apply wax across the entire vehicle with a steady pressure. Take a ride in your sparkling pickup and enjoy watching the heads turn! ← Dodge Air Suspension, Good Idea or Just Fluff?